Our school year is a little different (in terms of position on the calendar) from most school years. For one thing we started Sadie's kindergarten year the week after her fifth birthday. She was adamant that she needed to start school the moment she turned five and since I'd already purchased all the books we were going to use I gave in. That first year ran from June to April and when we finished her last day of school I planned on having a break before first grade. It quickly became clear, however, that that wasn't going to be a good idea for us. With Mae working with a therapist across the room, the idea of having Sadie free to flutter around the downstairs quickly became a problem. And after she asked me why Maggie "got to do school" for the fifth time the first Monday she had off, I was ready to pull out her new school books and get started. First grade ran from April 2014 until April 2015, which brings us to last week. A week ago we began second grade. It wasn't a dramatic switch from the previous year. Sadie had finished most of her first grade books at various points during the first grade year and so, for most subjects we've been doing second grade work for a while. 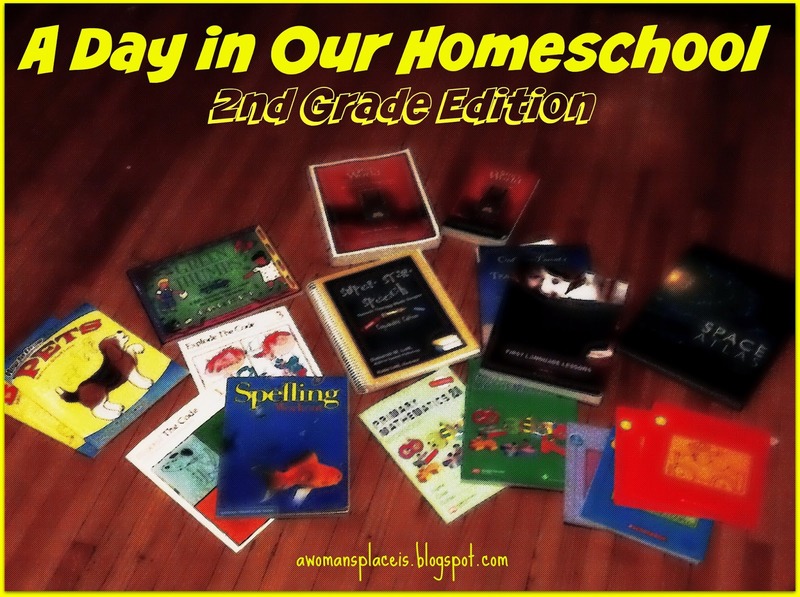 Last year I wrote a post on what a day in our homeschool looked like and what we do for each of our subjects. Today's post gives a glimpse of what we're planning on using this year. During kindergarten and at the start of first grade reading lessons were often a struggle. That is until we identified a midline crossing problem and I realized that there was a dramatic difference in how Sadie's was able to sound out words depending on where the book was positioned on the table. Since discovering that little piece of information Sadie's made steady progress in reading. We've continued to use The Ordinary Parent's Guide to Teaching Reading , but we supplement it with Explode the Code 3 (which finally arrived after being back ordered for months) and Beyond the Code Book 1: Comprehension and Reasoning Skills . For spelling we use the Spelling Workout workbooks, and she's currently on Spelling Workout Level B . We also use Bob Books for reading practice, along with various princess themed readers that she gets now and then as a treat. After her reading lesson Sadie copies a poem or quote in a notebook. Then she recites the poem that we're currently working on three times, which helps her to memorize it quite quickly. We just moved on to Singapore Primary Mathematics Level 2A . Singapore Math has really clicked with Sadie. And I have to admit that one of the things that I love about this program is that it perfectly matched out pace for the school year, so I wasn't searching for something to add and buying new books midyear because we didn't zip through and finish the math program in five months. It was just the right balance of difficulty and lesson length each day. For history we use The Story of the World. We're still on the first book both because we got side tracked and spent extra time on the lessons that we did, reading some of the longer suggested texts, and also because this year for us the focus was really heavily on reading and overcoming the mid-line challenge, knowing that in the future (like this year!) as reading gets easier we'll be able to spend more time on subjects like history and science. I'm hoping that as we have more time to spend on history we'll be able to finish book one and book two this year. 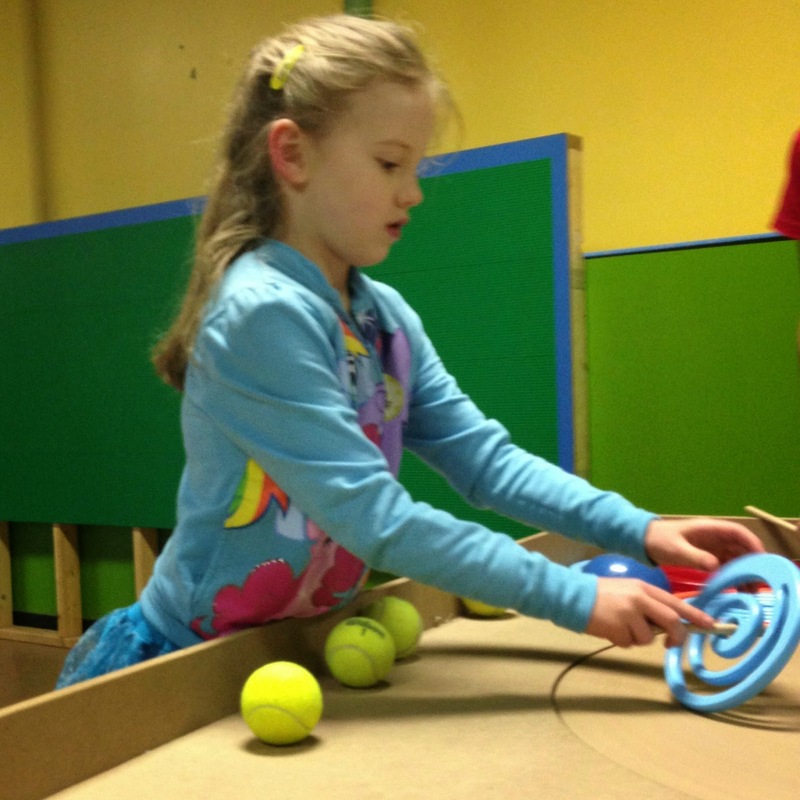 Our science approach, at this young age, is pretty hands on with lots of field trips. We've already visited the botanical gardens tree times in the last month (at Sadie's suggestion) and yesterday's walk involved her asking me more questions than I could answer about photosynthesis. There's also a nearby kids' science museum that we go to and the zoo is another key piece of our science program these days. There are so many different books that we use in both science and history that it would take paragraphs to name them all here, but since Sadie's interest at the moment is pretty heavily garden/plant based the book that I plan on using heavily this year is Green Thumbs: A Kid's Activity Guide to Indoor and Outdoor Gardening (Kid's Guide) . This is the one subject that I wish I wasn't teaching myself. Sadie needs speech services, but since our insurance doesn't cover speech that should be covered by the school district, and our school district has told us "nope, we won't take her... here call this number" (which no one picks up or calls us back from) our speech situation is still in limbo. I have registered us a homeschool, which according to the man at the Department of Education I talked to will legally require them to provide services, but I was also told that by the time everything went through they'd be rolling it over into next year (again). So I took matters into my own hand and after some searching discovered this book . It's a home study speech program and I'm hoping that between this book and the time I'm spending with Patch's and Mae's speech therapists getting help learning to help those two, we'll be able to make some progress while we wait for things to be ironed out with the various districts that handle these particular resources. I am planning on purchasing the second grade set of Faith and Life books. We finished the first grade set halfway through the school year. We're also moving on to this Bible , which is the same one I had when I was little, after reading last years children's Bible through more times than I can count. Our city offers quite a few really reasonable programs (think $10 for three months of classes) and we've taken advantage of them this last year. During first grade she took homeschool art and acting classes (according to Paul the acting class was hysterical to watch), and I'm hoping they're offered again in the fall. She's also currently gearing up for her first ballet recital and once a week she attends a karate class with Paul. Twice a month we attend her AHG meetings at a local parish where they've done everything from dance classes to sewing to cake decorating. At the moment cooking is probably the subject that she's most interested in and she begs for a "cooking lesson" just about any time I walk into the kitchen. We finally made a deal that we will make one recipe a week from the book she picked out at the book store (Silvana's Gluten-Free and Dairy-Free Kitchen: Timeless Favorites Transformed ) and I have to say that after she made the first recipe (thin mint cookies) I am really, really impressed. We've also discovered that Sadie is a big fan of the Dover "How to Draw" books. Especially this one . She basically spent the entire week we had off from school pouring over various How to Draw books and drawing flowers and princesses and castles all week long. That's this year's plan in a nut shell! I'm excited to see what 2015-2016 has in store for us! They don't even give a reason. Paul was the one who called and they just say "Nope. We won't do it. Call a charter school. They should take her." And the charter schools don't pick up or call back. It probably doesn't help that they're one of the really, really lowly ranked schools in the state (twelve hundred and something out of fifteen hundred schools) and the teaching staff is given a C- rating. Apparently now the Intermediate School District should pick her up and according to the last social worker actually send someone out to our house. I'm cautiously optimistic because I'm working with them with Patch (and soon James it looks like too), the only problem being there are so few days in the school year at this point that we'll likely get rolled over into next year. Did they even Eval her? Nope. The hospital did and put her at just under three years old for the way she says words (and at grade level for the words she uses). Join Home School Legal Defense Association, HSLDA helps in many ways and has a lot of history dealing with all sorts of problems with school districts. They even have letters for various things that members can use to get results. That, and who knows, with your husband's training, he might impress them so much that they decide they want to hire him. There are some books I can suggest for the science garden horticulture side: first, GOOD WEED BAD WEED by Nancy Gift and GOOD BUG BAD BUG by Jessica Walliser are wonderful easy to use references that are not terribly expensive and highly kid friendly. I am sure I have seen some good books on photosynthesis written for elementary age children-- have you googled it to see if there are any great web pages for her? For you and to share with the children, you might want to try A CATHOLIC GARDENER'S SPIRITUAL ALMANAC by Margaret Rose Realy. Margaret Rose Realy's book is full of history, saints, scripture and gardening-- a unique book that you may find adds all sorts of interesting enrichment to your home school. The May section lists plants that have symbolic connections to our Catholic Faith, the January section gives a list with drawings of ancient symbols and their meaning and how that relates to gardens. Have you seen the "Draw Write Now" books? Those were a big hit with Nicholas before he got into writing with other things (we use the Writing Adventures books). He didn't like Explode the Code at all. And so we tried Draw Write Now as a fix, and they are awesome - or they were before we used most of them :) Now I find all kinds of other books for him to use as writing practice. In California, going to private school or homeschooling voids your right to get services at a public school. Might be the same there. That's actually not true. My Dad was a high school administrator for decades and kids definitely still have a legal right to therapies that they qualify for in California (I believe until the age of 21... I'm pretty sure it's more expansive than here in Michigan). He was one of the first people I called when we started running in to these problems. I believe you do have to register as a private school, but the homeschoolers I know in California do that anyway (and that seems to be the hoop we need to jump through here as well). Yes Cammie's right, our daughter is autistic and we homeschool (and live in California) and our last IEP, we denied their public school offer and still received 2x a week speech therapy at our local elementary school for free. That's not true. When the child is parentally placed in a private school, they have no right to public school services in California. They might receive them, but they are not a right. On a separate note, I do know that isn't the case in Michigan having had at least four people who work in special education in the state tell me that they can't legally deny her the therapy (just today I was having the conversation with someone from the Intermediate School District, which specifically handles that... and she came to the same conclusion, that our school district has to cover it since she needs it)... and yet here we are. Does your health insurance partially cover speech? Our son sees a private speech therapist twice a week. We got to choose the best therapist available, and after we meet our deductible, the sessions will be partly covered. Some insurances cover more. I'd look into circumventing the school district (in my experience, unless the speech problem is severe, they deny services anyway.) We love our private practice therapist! Ours only covers speech if it isn't from a developmental delay. We tried that first and had evaluations for both girls at the rehab facility they get OT at and I thought we were finally set and then the insurance came back and denied it and said that they never cover speech therapy for developmental delays. I tend to be a fan of private practices too because in our experience they've been way more consistent (Mae has had about 60% of her sessions canceled at this point and it's incredibly frustrating). Sadie's enunciation puts her at less than three years old according to the hospitals eval, which I think should qualify her... if I can just get someone to even evaluate her with the school district. It's just so frustrating. From whence do our children derive a "right" to "free" special education services? Is his/her "right" predicated upon our obligation to pay taxes? Because SOMEbodys paying all your therapists and special Ed service providers. And if the money weren't there, Big Brother wouldn't be enshrining your "rights" within reams and reams of laws. Somebody has swallowed a heckuva lot of Kool-Aid to presume that doctors, nurses, evals, and specially-trained special education specialists are the only people to be trusted with the welfare of our children. "Somebody" is a misnomer. "An awful lotta people" is more accurate. A big part of the reason that the state has an interest in supporting special education services is that early intervention is shown to save a whole lot of money further down the line. By providing services now the hope is that the kids provided with these services will be able to better function further down the road. Kind of like children's rights to public education. And I came from a position of being pretty suspicious of doctors/nurses/therapists/social workers going in to Mae's evals, but it was pretty clear that the help that she needed went far beyond what I could offer her. It was actually incredibly humbling as a homeschooling mom who values educating my children to realize that I needed help. But after watching her therapists work with her (and seeing the way they'd care about her) I've come to realize that asking for help was the best thing or her, just as I, her mother, has accepted help because it's the best thing for her. 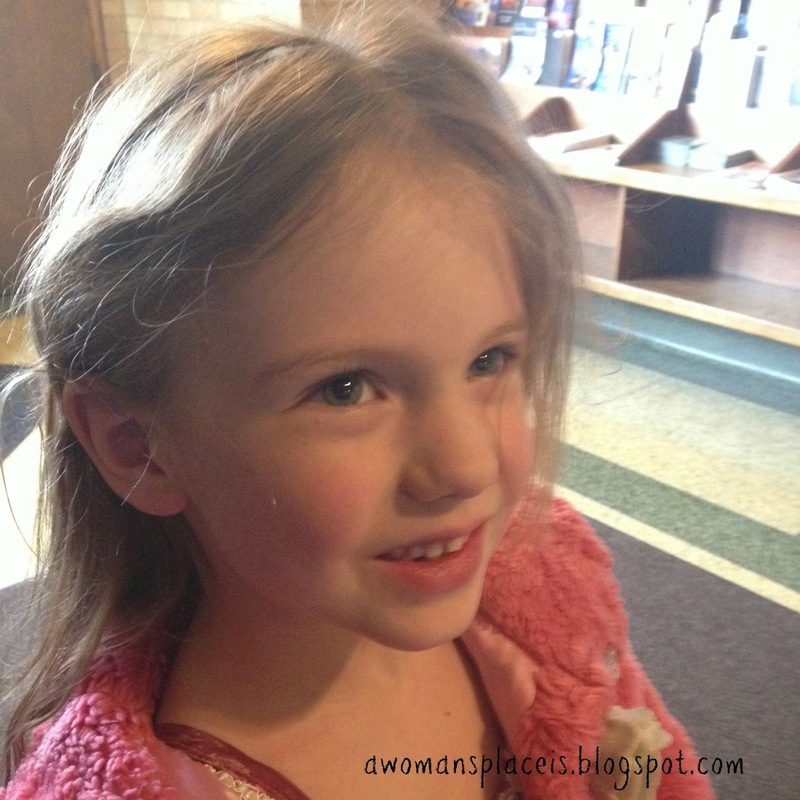 In the post above I wrote about how I am doing at home speech therapy with my daughter. This is, after all, a post about homeschooling. I've actually gone out and gotten special training from our local university in working with our kids and try to absorb everything I can asking questions and watching the therapists who do work with out kids. But I still know that some things are beyond what I can help with and I'm not doing them any favors pretending to know everything when some areas are beyond my expertise. Why I was thrilled to hear her ask "Why?" WIWS: It Finally Feels like Spring!